Dance Theatre and Object Theatre - general public – 1h20 -One actress and a dancer Theme: "realize your dreams" - "madness, conformity and freedom". This is a poetic romance inspired by the life of the inventor and German artist Gustav Mesmer (1964) as well as texts by the Swiss Romand writer Attilio Sandro Palese. We create on stage an unusual encounter between a real character (Gustav) and a female fictional character that represents an allegory of Attilio Sandro Palese and Tania De Paola reflections. Gustav was diagnosed, in his youth, with schizophrenic and paranoid disorders and had to spend thirty five years of his life in the German psychiatric hospital, Bad Schussenried. He has only one dream, to fly! 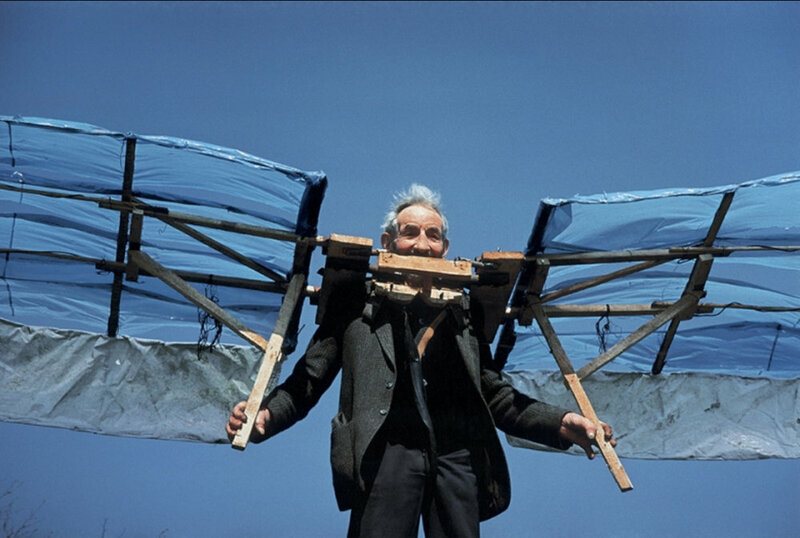 In 1964, finally released, he settled in a tiny village where he spends his time between his strange inventor’s workshop and repeatedly descending the same field of wheat by straddling his flying machines that never leave the ground. Despite his failures, his grand smile never leaves him. The female character is a neighbor, an exuberant woman, author and philosopher of Scandinavian origin. Despite his overflowing inspiration, his incessant questioning of life prevents him from taking action, and form river of words that never cease to descend the slopes of thought without ever taking off to live the present. Obsessed by her quest for philosophical happiness, the female character is intrigued by Gustav, who utters only the two interminable words “to fly!". She will spend time beside this man and never interrupt him, for whom everything seems so simple and happy. This show is also a landscape of artistic investigations. Tania de Paola must invent a particular gesture related to the mental handicap of Gustav in addition to the other choreographies. There will also be unconventional work for Yves Besson, involving models, to animate the mechanical inventions of Gustav in a bestiary of imaginary moving beings. For these two creators, it will be a new approach to the art of dance movement and the manipulation of objects, in the service of history and the stage. Regarding the musical score, Jérome Baur will compose for different dimensions, such as reality, daily life, madness, imagination and dreams. This dense, philosophical story, full of poetry and humor will be rooted in reality with the help of the playwright and historian, Bent Holm. For the dialogues, the writer is Attilio Sandro Palese. Finally, we will develop the olfactory dimension of the show with Michel Roudnitska, parfumeur-nez in Grasse, France.